Founded in 1630, Boston is the largest city in Massachusetts. More than 645,000 people call Boston home and the city offers tourist attractions, museums, sports, colleges and universities. The state's major courts are here as well as the Massachusetts State House and Boston city offices. Located in Suffolk County, Boston hosts a number of important courts. Suffolk County Superior Court is located at Three Pemberton Square and has jurisdiction over civil actions likely to recover over $25,000 in damages. The district courts in Boston are organized in the Boston Municipal Court. The Boston Municipal Court has jurisdiction over civil actions in Boston that are likely to result in recoveries of less than $25,000 in damages. Courthouses are located in downtown Boston, Dorchester, Brighton, Charlestown, East Boston, Roxbury, South Boston, and West Roxbury. The Supreme Judicial Court and Appeals Court of Massachusetts are both located in the John Adams Courthouse at 1 Pemberton Square in Boston. Boston is also home to the United States District Court for the District of Massachusetts and the United States Court of Appeals for the First Circuit, both located at 1 Courthouse Way near the Seaport. Boston is the capitol city of Massachusetts and the State House is located on Beacon Hill, at 24 Beacon Street. The Governor's Office is located there, as well as the Massachusetts Legislature, or General Court. There are two branches, the Senate, which has 40 members and the House of Representatives, which has 160 seats. 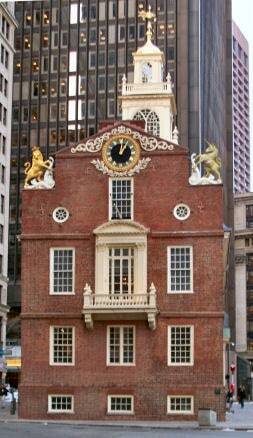 Designed by Charles Bulfinch, the State House was built between 1795 and 1798. It replaced the Old State House, which is located at 206 Washington Street. Boston is served by a Mayor and 13 city councilors. There are nine voting districts and four at-large council members who represent the entire city. Boston City Hall is located at 1 City Hall Square. Boston Police have 11 district stations, including for Downtown and Charlestown, East Boston, Roxbury, Mattapan, South Boston, Dorchester, South End, Brighton, West Roxbury, Jamaica Plain and Hyde Park. Boston is home to many college students. There are more than 50 colleges and universities in the Greater Boston area and most of them are based in the city itself. They include Bay State College, Boston University, Bunker Hill Community College, Emerson College, Massachusetts College of Art and Design and Massachusetts College of Pharmacy. Others are Suffolk University, Simmons College, Boston Conservatory and New England School of Photography. Law schools include Northeastern University School of Law, New England School of Law and Suffolk School of Law. Breakstone, White and Gluck is located at 2 Center Plaza, in the heart of Government Center in Boston. The firm has, for more than twenty years, been successfully representing individuals living in Boston and throughout Massachusetts who, as result of medical malpractice, product liability, a truck accident or a car accident, or other negligence, have suffered personal injury and wrongful death. The personal injury attorneys of Breakstone, White and Gluck are experienced in both civil trials and appeals in state and federal court. The lawyers are available for a free consultation through this online form or by calling 800 379 1244. Breakstone, White & Gluck is located in downtown Boston, between the Adams Courthouse and Boston City Hall. The Government Center address is convenient to all subway and commuter rail lines.